The 2011 Proof American Platinum Eagle coin moved briskly in its opening days, despite a collector-distracting holiday weekend, a deterring price point, and an increased mintage limit which can suppress call-to-action buying. Given said factors, the coin’s debuting sales were not only comparable, but better-than-expected when contrasted against the past two issues which sold out in a single week. 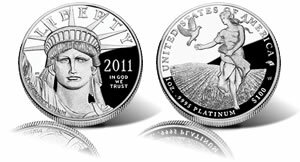 However, the 2011 Proof American Platinum Eagle inventory will take longer to deplete than the previous two issues, the latest US Mint sales figures suggest. The US Mint indicated that buyers ordered 6,786 of the 2011 Platinum Eagles between their Thursday release and Sunday. The United States Mint collected nearly $14.2 million in sales at the coin’s $2,092 price — the highest ever charged for the one ounce, .9995 fine platinum coin. 2011 Proof American Platinum Eagle coins should be available into next week (and beyond?) considering its higher price, higher mintage and the tendency of weakened demand as a new issue ages further from its release. In other US Mint sales news, the 2011 American Buffalo Gold Proof Coin advanced 2,480 during its first full week of availability. Its sales total stands at 8,262. The Mint did not publish updated figures for the collector Yellowstone National Park 5-Ounce Silver Uncirculated Coin which was a focus in last week’s report. They were nearing a sellout then, with 24,626 of the maximum 27,000 ordered. They are still available for $279.95 on the Mint’s website (http://catalog.usmint.gov/), but few likely remain. Finally available are "debut sales" for the 2011 Presidential Uncirculated Set. After an extended delay in publishing their opening numbers, the US Mint has indicated 28,111 of the sets have sold since their release on April 27. *The as of date for US Mint bullion coin sales is Tuesday, May 31, 2011, except for the ATB 5-ounce coins which is Thursday, May 26. 53,000 of the 2010-dated 1 oz Gold Eagles remained for sell this year, and buyers must order one of them for every four of a newly dated issue. The bullion sales figures also include 469,500 of the 2010-dated Silver Eagle coins sold in January. The collector coin sales figures above have an "as of date" of May 29, 2011.